If you think America is ravaged by debt, stop and take a look around. The United States is one of the only developed nations on Earth shedding debt in a meaningful way. Virtually all nations, including the United States, have seen a balloon in government debt since 2008. 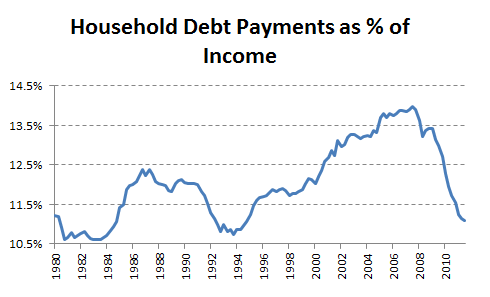 But more than any other nation, the U.S. has seen debt drop significantly in the household and financial sectors. Debt in America's financial sector has fallen back to 2000 levels. According to the McKinsey report, this amounts to banks deleveraging by over $2 trillion, about half of which "can be attributed to the collapse of Lehman Brothers, JP Morgan Chase's purchase of Bear Stearns, and the Bank of America-Merrill Lynch merger." By comparison, most of Europe's and Japan's financial sectors have leveraged up during the last four years. Since 2008, U.S. consumers have freed themselves of over half a trillion dollars of debt, or about 11% of GDP. The vast majority of that decline has come from defaulting on mortgages. Importantly, another quarter-trillion dollars of bad mortgages remains in the foreclosure pipeline, McKinsey reckons. That should mean more debt reduction in the near future. American households are deleveraging so fast, in fact, they should "complete their deleveraging by mid-2013," according to the report. Households throughout the rest of the developed world are faring far worse. British and Spanish households, McKinsey calculates, will be deleveraging for the next decade. Add in the counteracting forces of rising government debt, and these countries -- most of Europe, really -- cannot yet see a speck of light at the end of the tunnel. Why is America faring so much better? One reason has to do with laws regarding mortgage "recourse," or a bank's ability to go after defaulted borrowers' other assets. In several American states, borrowers are free to walk away from their mortgage without suffering much more than a tarnished credit score. In virtually all other nations, a mortgage is a bond the bank can -- and will -- hold you liable for. These rules almost certainly helped the American housing bubble inflate, but they're playing an equally astounding role in helping it burst. It's also generally easier and more accepted for Americans to file bankruptcy compared with Europeans. A 2009 paper by the European Credit Research Institute looked at the number of bankruptcies per 10,000 citizens. Compared with the U.K., Germany, and France, Americans file for bankruptcy at a rate of around 2 to 1. There's a good explanation: Filing for bankruptcy in Europe can mean giving up your entire financial life. In America, it often means an afternoon to the courthouse and not much else. As I've written before, about the same number of Americans were awarded bachelor degrees last year as filed for personal bankruptcy (1.6 million). Of course, American households and businesses deleveraging is offset by the federal government undertaking the largest bout of leveraging since World War II. This is (by intention) slowing how fast the economy as a whole can shed debt. At current rates of overall deleveraging, it could be another decade before America finds itself with a comfortable debt load. From 1980 to 2008, total debt went from 160% of GDP to 370% of GDP. It's since fallen to just 354% of GDP. Deleveraging is a slow process that keeps the lid on our recovery. But give credit where credit is due: The U.S. is moving in the right direction. That's more than most of the world can say right now. At the time this article was published Fool contributorMorgan Houseldoesn't own shares in any of the companies mentioned in this article. Follow him on Twitter @TMFHousel.The Motley Fool owns shares of JPMorgan Chase and Bank of America.Try any of our Foolish newsletter services free for 30 days. We Fools may not all hold the same opinions, but we all believe that considering a diverse range of insights makes us better investors. The Motley Fool has a disclosure policy.